Shock Horror, tactical AKs! But in all seriousness I've been looking around for one and preferably one with a folding stock. Action Hobbies did have a few CYMA ones, but they're all out of stock. The one I wanted in particular (the romanian one with a wire stock) is also available on ehobbyasia, but I'd rather not worry about international shipping, customs and the like. Does anyone know of any decent ones in stock in the UK? Not quite the wire stock version, but it's cheap and from a very good site! Try ZeroOne if everywhere else is out of stock... email them if it is "out of stock", as they just had their NAE, and they took a load of guns down to their event. im not a ak fan but i do like the tactical aks and the black railed ones with different stocks. Taiwan gun does not have the wire stock in stock, but gunfire does. Both excellent shops and great to buy from. How does one go about sending them my UKARA number? Would I just email them it? I put it in the notes box and ask them to put it on the outside of the box. Both companies speak good English so its never been a problem. Both companies will also do spring downgrades for the price af the spring as most cymas will be about 400fps. I have ordered 5-6 guns of 'em over the last 12 months or so. That's good and actually fair. When will cyma learn that they don't need guns that do 50000fps out the box? 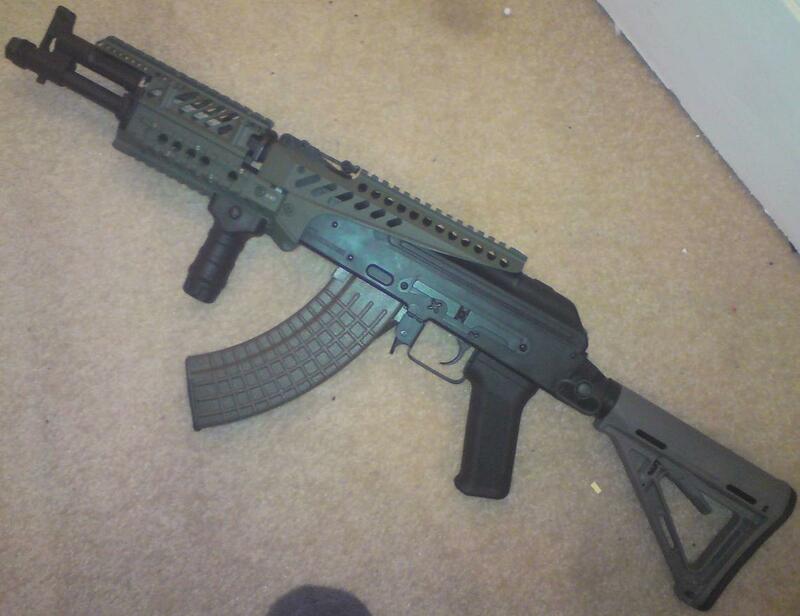 You know a proper SR-47 takes standard AK mags? Though I'm guessing your plan is to just stick those KA mags in to an AR? The midcaps in a mid priced gun would be a considerably cheaper option than an SR47. No doubt, certainly not denying that. Just saying that's not an SR-47, it'll still be an AR. If that's what someone wants to do because it's close enough for their purposes that's perfectly fine. When I saw the pics on the AH site, I was into this tactical AK, but it was out of stock - I signed up for an email update and they got more after about 6 weeks. Considering that she cost me £125 with reasonable P&P, I'm glad I did buy from them. That said, the one from gunfire that bigshep came up with looks great and the price isn't too bad, if you're in a hurry. To my mind an SR 47 is an abomination lol! Mankini's tan tac AK is great but I hate the black tac AKs. If anybody's interested in a tactical AK (not the Romanian one though) Patrol Base sells one or two. I know it wouldn't make a "real" SR-47, but it's as close as I can get without investing/forking out a ton on one of those hurricane kits. Mate, do you find that the metal frame for the rails makes your AK front-heavy?